Diarrhea is uncomfortable and aggravating, and if it goes on too long, can actually lead to dehydration and fluid imbalance. There are many causes of loose stool, according to the University of Maryland Medical Center. These include infection by parasites or viruses and irritated, inflamed intestinal linings. While the medical center suggests that most diarrhea will go away in a few days and doesn't necessitate a trip to the doctor, there are several herbal teas that can alleviate symptoms and help you stay comfortable and hydrated while you heal. Astringents are drying agents—they can help to dry out the membranes of the intestine and reduce water and mucous secretion, according to the University of Maryland Medical Center. The center suggests mixing 1 heaping teaspoon of blackberry leaf or raspberry leaf with 1 cup of hot water to make two servings of tea, and they recommend drinking ½ cup of tea per hour while symptoms persist. Health 911, which provides information about both traditional and folk remedies for symptoms, recommends a black pepper and kelp tea, which they say is particularly helpful for diarrhea caused by drinking unpurified water. To make a tea, they suggest mixing 3 teaspoons of black pepper with 1½ teaspoon of kelp in 2 cups of water. According to the website, this tea can be consumed as often as you wish. According to Tea Benefits, chamomile tea has been used for centuries to treat digestive and stomach upset, including diarrhea. Notes the site, "It [was] considered a universal remedy by the ancient Egyptians. Now, researchers in England have found new evidence that chamomile tea may actually help relieve a wide range of health ailments." Chamomile is a very common tea—in addition to purchasing the whole dried herb at health stores, you'll find chamomile tea bags at most grocery stores. 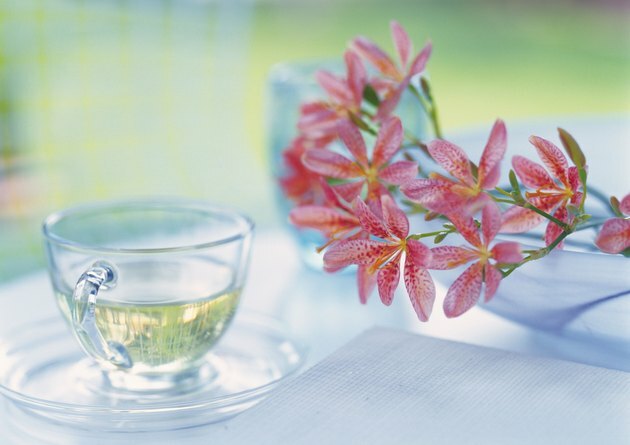 Can Herbal Tea Dehydrate You?